Given my great love of Mercury/Hermes any thought of messenger or messages immediately brings this fleet-footed being to mind. Seriously, winged cap, winged shoes! Who wouldn’t want those?! 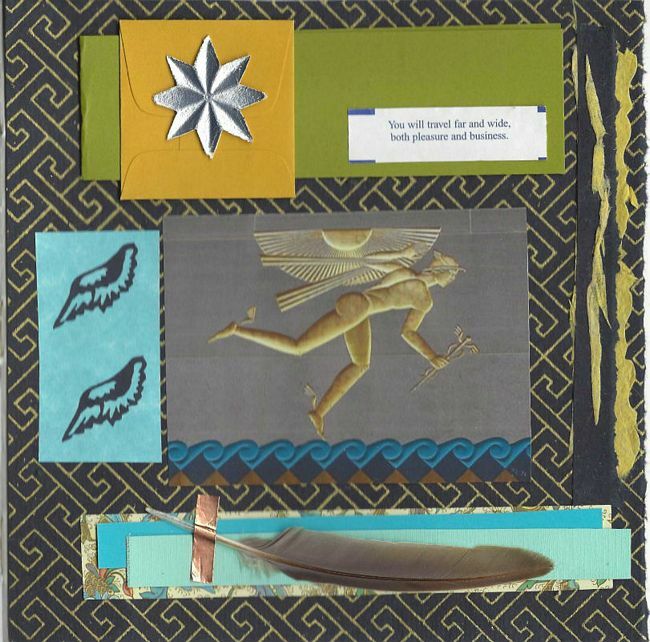 Because Mercury/Hermes is known as a messenger, I thought for the longest time that my affinity had to do with my devotion to mailart, and my loving invocation of the patron of communiqué delivery. And I do believe that’s how I first allowed myself to welcome in those energies and start my relationship. Just like any true friendship, things have evolved over the years as I have come to understand and experience the deeper layers of connection. Mercury/Hermes has indeed become a beloved ally. 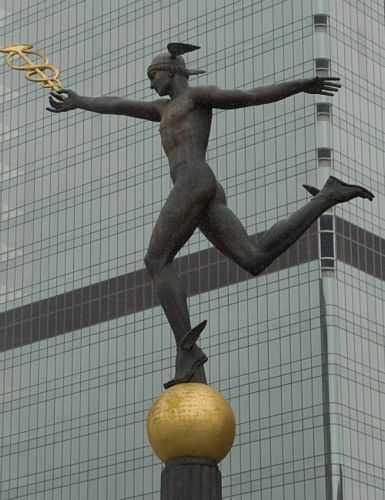 Hermes (the Greek iteration)/Mercury (the Roman iteration), messenger of the gods, fact-gatherer and disseminator of information, was the son of Zeus and the goddess Maia, who is a springtime goddess associated with the act of blossoming. But there’s another aspect of Mercuy/Hermes that is less widely known. As a psychopomp, able to move between worlds above and below, he escorted and rescued. Crosser of boundaries, he rescued Persephone from the underworld; he released Ares from a jar; he freed Dionysius from his father’s thigh. His winged shoes (talaria) symbolize his function as a go-between from the world of human affairs and the realm of the gods. He delivered messages from the gods to mortals, and that act characterized his function as a bridge from the mundane to the sacred. He was clever and quick, an inventor, creator of musical instruments, a powerful conduit, bringer of sleep and dreams, and yes, sometimes a trickster. It took me a while to recognize how active Mercury/Hermes is in my life, but once I made the conscious connection it was truly like recognizing an old friend. I call myself a Messenger and Illuminary in my work; my work in the Akashic Records is certainly messenger work as is my channeling. And let’s not diminish the importance that actually sending messages through the post has held for me. I’m pretty sure Mercury/Hermes steered me into mailart. And my life-long devotion to dreamwork – I think we can guess the inspirer. 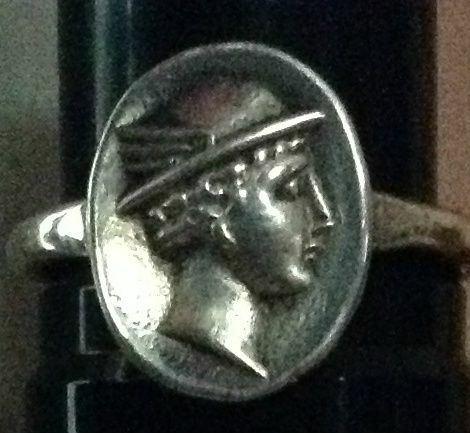 Here’s a favorite object of mine – my Mercury/Hermes ring. I had to take it off to get a decent picture of it, but its sized so I can wear it on my pinky finger which happens to be the finger of Mercury per palmistry conventions. I love having this double reminder. But I’m particularly delighting in the idea of having this ring as a touchstone as I begin some major writing projects. I’m hoping Mercury/Hermes bestows some of his great communication skills. I’m on a not-so-secret mission to spread love into the world widely and encourage everyone else to as well. Something that has me firmly in its grip is my continuing dedication to a steady outflow of love letters. I truly believe the world is a better place when we make a point of telling each other we love them, and I like doing my part keeping the post office busily engaged in the task of transporting love across the globe via actual snail mail. Just think of all those love vibrations mixing it up with the stream of junk mail and bills. Think of love letters energetically lightening up the conveyor belts in post offices across the world sending little sparks of love into machinery. Do you suppose the mail carrier’s bag is a little happier when it has a stack of love letters nestled amidst its load? Well, perhaps you can’t imagine that, but you can certain imagine the delight of receiving a note. I absolutely believe we could do a far better job in our world living as heart-centered beings devoted to loving-kindness. Can you imagine how different everything might look under the pervasive expression of love and appreciation? What if we all sent love letters to one another? What would it be like to be more generous with our love? Doesn’t everyone deserve a little reminder they are seen and recognized, loved and appreciated? And have you ever written a love letter to yourself? Do it! You deserve it. Claim your position as nuncius send your messages widely into the world. So tell me, do you have a special relationship with Mercury/Hermes? Write love letters? Want a pair of winged shoes? Do tell – you know I love to hear. One of my close friends loves to get letters, so I try to write her an occasional one or send her a postcard from somewhere interesting. My blog is probably my message into the world since I have readers from all over. I’ve never thought of myself as sending messages, although I try to live my life in a way that shows resilience and positivity. Isn’t it delightful to visit the mailboxes of people who love getting notes from you, as your friend does? I think it’s one of life’s joys. 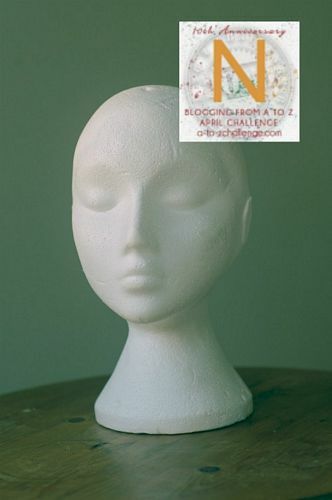 And yes, I think our blogs are indeed ways for us to share our voices and send messages. I think we’ve very lucky in so many ways! I wouldn’t mind some winged shoes and absolutely believe in writing love letters and sending messages! Very cool ring. I don’t know if I could get used to a ring on my little finger. It makes me smile knowing you’re a purveyor of goods for others to send messages as well Janet. And I imagine you could get used to rings on any and all of your fingers – it seems to me they love being adorned as much as I like adorning them. Yes, I think your posts are very much notes to friends Ally – and that’s delightful. I can’t help but smile thinking of rows of winged shoes stacked in all kinds of sizes and widths in some cosmic shoe store. We’d find your size for sure. This one hit me at just the right time…and yes, I love the idea of sending love letters out into the world. We certainly do need to spread more love and joy!!! And since I have been neglecting my writing lately, this was just the kick in the pants that I needed to bring me back around. We all know that life pushes and pulls us at times in many different directions. But it is most important to take time to go inward, and reflect upon what is really most important to each of us individually, so that we may bring forth the very best in ourselves, to share with others. This little light of mine…I’m gonna let it shine!!! Thank you Debra, for your winged message…and really, who wouldn’t love a pair of winged shoes??? I love buying pretty note paper usually with a pressed flower and it’s pretty little envelope and giving them to friends on birthdays and other special occasions. And urging them to write that note to their loved one/s. I always think I’m going to keep a little packet for myself – next time I find such ones, I’ll keep them for myself and do just that – if this isn’t a reminder I don’t know what is. Gifting note paper is lovely Susan, and I do hope you’ll give yourself the treat as well. The world needs a boundless supply of love messages, don’t you think? All kinds of messages and messengers are there, if we learn to listen. Whispers of the universe. I couldn’t agree more Beth. I always smile when I think of how this journey has unfolded for me. And thanks for your kind words Samantha. Day before yesterday, as I was waking up, I had a brief hypnagogic vision of 2 white ambulances speeding by, red lights flashing, with the word “Mercurious” clearly written on the side of each vehicle ~ a pretty clever play on words. I’ve thought a lot about the vision’s layers of symbolism, and also about what it is ambulances and ambulance crews do and don’t do. In astrology, Mercury as *messenger* is probably most associated with the sign Gemini and the 3rd house ~ having to do with, among other things, both messages and messengers, also short trips from one place to another. I can definitely see how both Mail Art and love-letters would tie in with Mercury. On the other hand, and based on your description of what it is you do, I suspect your dreams and creative gifts of the unconscious are a function of either your Neptune and its aspects, and/or, (and I think this is more likely), a strong 12th house placement, maybe of a personal planet or even Neptune itself. Which isn’t meant to diminish in any way the role Mercury can play as messenger or bridge between worlds. What an amazing image and Mercurious absolutely delights me! I do indeed have Neptune in my 12th house and understand the gift of that. And I also agree things are always complex and multi-layered, cycles within cycles, and finding our ways to understanding can take the most amazing paths. Guidance and support comes to us in many guises and I am truly grateful for all the benevolent benefactors who have graced me with their presence. I like trickster characters, and Hermes is definitely one of them. 🙂 I especially love how they can move freely between worlds, and cross boundaries. Trickster energy is quite magnetic isn’t it?! And you no doubt get to see a wide range of them in all the wonderful stories you are engaged with. I often think what a fabulous world you are immersed in. I am very glad to learn about the word Nuncius – a messenger. In fact, I would like to share info about ‘Narada Muni’ (begins with N coincidentally). He is a Vedic sage, a traveling musician and storyteller. He carries news and enlightening wisdom. He also travels to distant worlds and realms in order to communicate and act as a messenger of useful information. Glad to know about your inspiration from mercury – and your ring is very beautiful! Your concept of love letters is very inspiring – the vibes do have an effect and if collectively we feel love and harmony, the world will be more peaceful and harmonious. Thank you for sharing about Narada Muni – I suspect you’re sending me down another rabbit hole I’ll quite enjoy exploring. I love the image of the postman’s bag being happier with loving letters in it. And good luck on those writing projects you’re embarking upon! Thanks for the good wishes Anne!